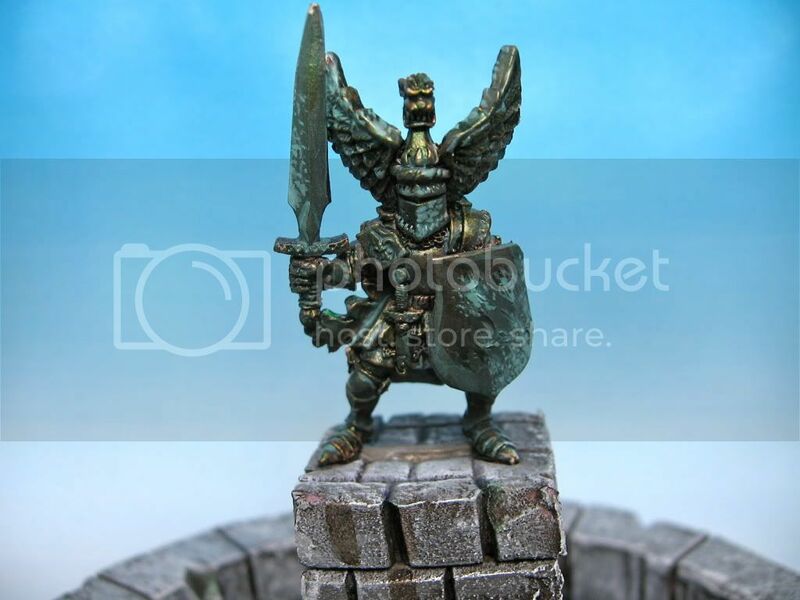 The model n the top is a Grail Knight on foot from Warhammer Quest or something. When I was 12-14 I had a somewhat large Bretonnian army. I don't think I ever painted this figure and so I decided to use it on this model. It is a great figure. The base is an old CD and the stones are made from pink insulation foam. Here is an old picture I took back when I made it. I used Woodland Scenics Water Effects for the water. Over time Some bubbles have appeared (from the styrofoam I think). Blue ink from drawing in the stone shapes has leaked into it as well. 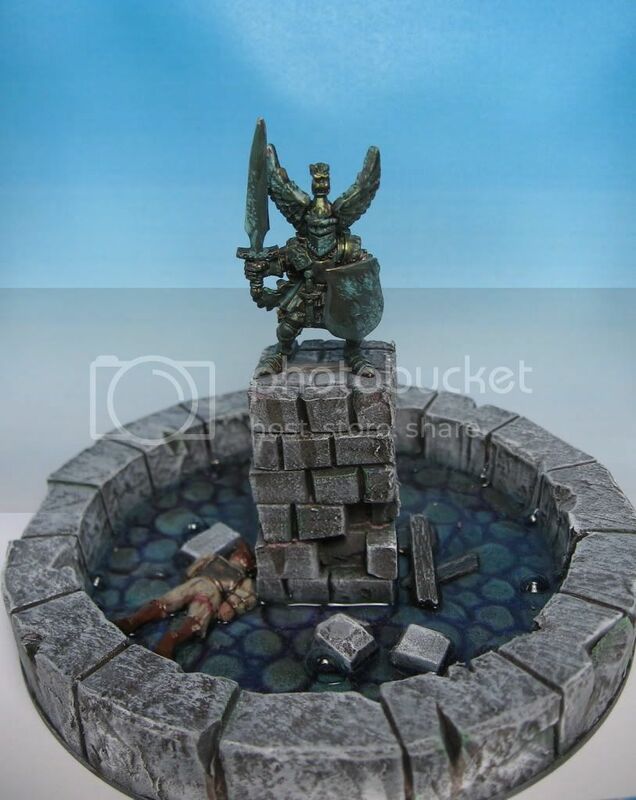 The corpse in the fountain is an old Empire Militia model. 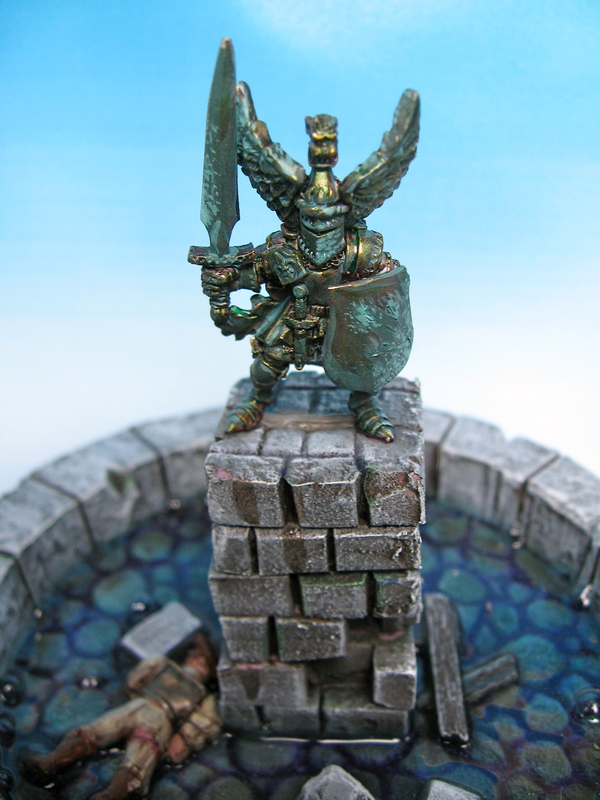 I painted the verdigris by first painting the statue in brassy colours working up from tin bitz. I think I then made some washes out of an old blue and turquoise colour and glazed and washed it on different areas. I have some more Flames of War models nearing completion and a few other older projects to post up on the blog in the next few weeks. Thanks for visiting! The bubbles may not have been intentional, but they really do seem to add something to the model. Nice work! I agree with the comments above, great work! 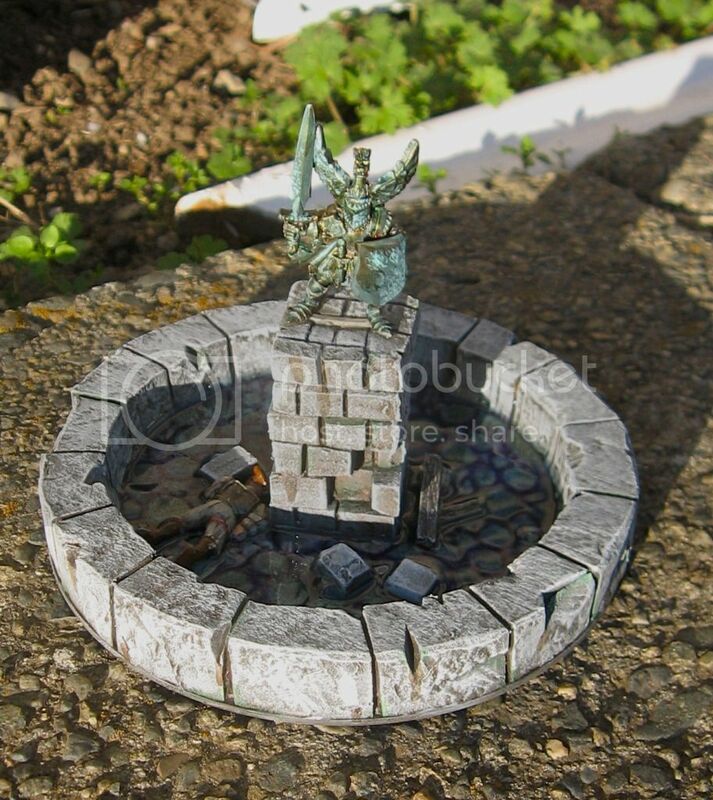 Minutiaeofwar is right about the bird droppings, ha ha. When I made my table I used Woodland Scenics water effects as well. Bubbles (lots of them) formed during the curing process over where I had painted. I'm guessing it had to do with the temperature of the effects when I applied it and a reaction to the paint. Some days ago I found your blog. I like your works and tutorials... so you are in my blog list. Thanks for all the comments. Sorry for the slow reply, I've been pretty busy. Minutiae-Some bird droppings would have been a good idea. Might be hard to do convincingly. I painted and built this model a long time ago as a quick terrain piece. Matthew-I think the bubbles are from the styrofoam over the CD base. I used styrofoam plate. You can see the ink from the pen I used to draw the stones also leaked out. Pablo-I'll add you to the blog list. Thanks for adding me! Glad you like the blog. 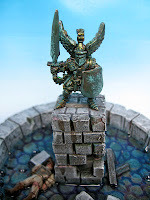 Minutiaeofwar-I keep trying to add your excellent blog to my blog rolls. Unfortunately I am unable to add it for some reason. Maybe blogger dislikes wordpress? That seems strange, I can see other wordpress blogs in your blog roll - like "eternalhunt" for example. Would it be possible to copy the same settings as that blog link? No idea why. I tried it again. It is a widget and for some reason when I try to add it it won't let me save it. I've tried it a few times now. Do you have links or livefeeds blocked or anything?